I made a red velvet cake – without red food coloring. I love red velvet cake. I don’t know what is so irresistible about it. Is it the contrast between the deep red cake and the snow white icing? Or is it just the inexplicable flavor of the cake that you can’t put your finger on? Well, this cake I made proves that red velvet cake is delicious even without the red food dye. It’s called a half-cake because I only made one layer and cut it into half. 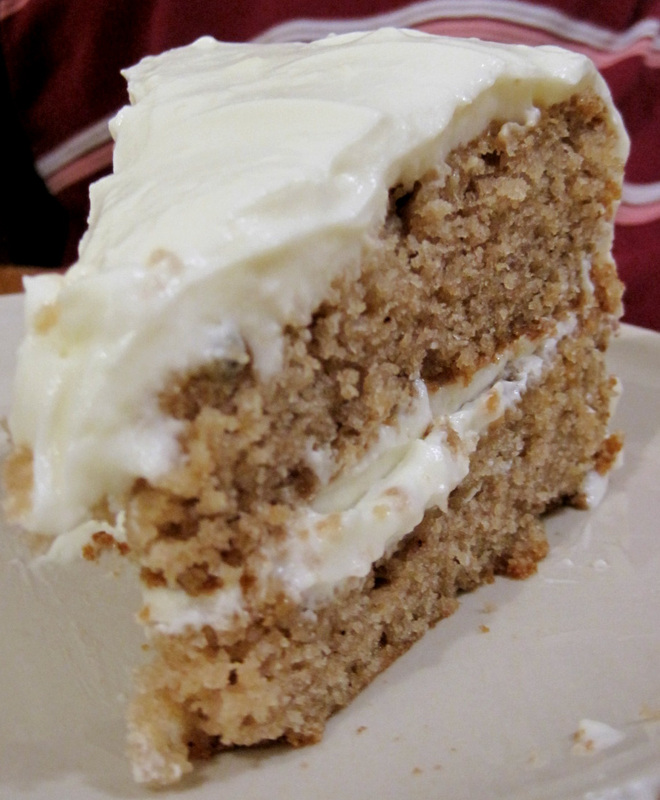 It is such a sumptuous treat for such a simple cake. There was no butter in it, but the oil made it very moist and flavorful (and a lot easier to mix up too – creaming butter without a mixer is a huge pain). The whipped cream frosting is very simple, and would be a lot simpler if I didn’t have to whip the cream by hand. But hey, the lack of fancy tools to aid my baking helps me to 1) bake less and 2) work out more! And oh, my frosting skills are not quite there yet. One thing I noted was that the cake sunk a little bit in the center. I don’t know if it’s because I substituted out self-rising flour, or what it is. Preheat oven to 350 degrees F. Line a 9 inch round cake pan with parchment paper and grease and flour the sides. Mix the flour, cocoa and baking soda together in a small bowl and set aside. Mix the buttermilk, vinegar, vanilla and food coloring together in a liquid measuring cup and set aside. In a mixing bowl, whisk together the egg, oil and sugar. Using a heavy duty scraper or large spoon, add the flour mixture and milk mixture to the egg mixture alternately in three parts, stirring until flour is mixed in. Pour batter into the prepared pan and bake for 25 minutes or until a pick inserted in the cake comes out clean. Let cool in pan on a rack for 10 minutes, then carefully remove from pan. If using a springform, you can remove the sides and invert. 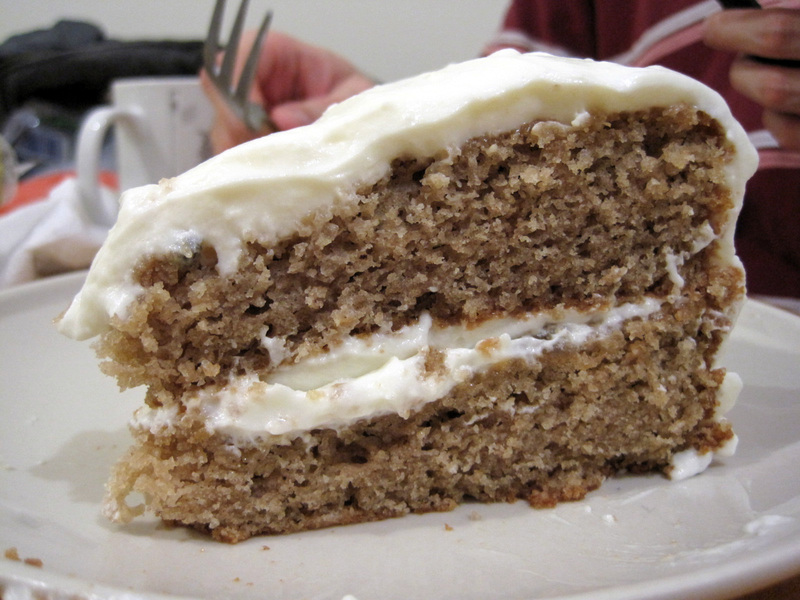 To make frosting, whip heavy cream till soft peaks form. Mix cream cheese, sugar and vanilla till creamy. Fold into whipped cream. To make a layer cake, cut the cake round in half. Ice one half. Stack second half on top and ice the whole half-cake. It’s easier to whip cream when the bowl, whisk, and cream is very cold. Adding a tablespoon or two of sugar from the 1 cup into the cream before whipping helps it whip up faster.